European underwear from 1700 to about 1900 and what this reveals about menstruation, at MUM. Read an earlier discussion of this: What did European and American women use for menstruation in the 19th century and before? In some societies today, women use no special "device" to absorb or catch menstrual flow - they simply bleed into their clothing, even if they must stay in a special place during their period (for example, among a group in India; I have heard stories about others). Apparently many women in certain parts of Europe from 1700 to about 1900 also used nothing special - not rags, not pads, not sponges or anything else - during menstruation, but bled into their clothing. And, because most early American settlers came from Europe, this suggests that some (most? all?) Americans, and probably Canadians, also bled into their clothing at some point in their nations' histories. Read my grande finale conclusion, with proof. 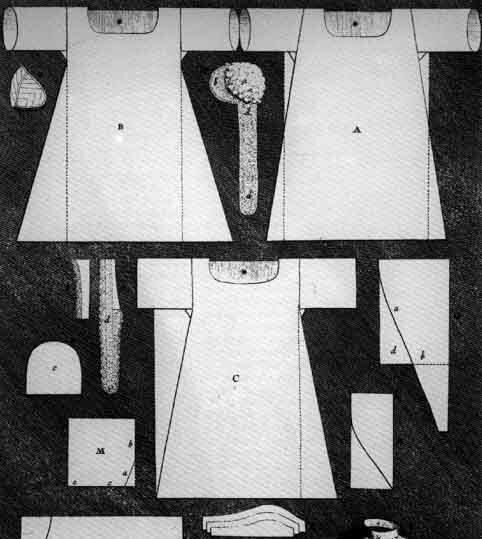 In 1700 (and long before) women and men in Germany and France, and probably other European countries and America, wore a long shirt from shoulders to calves, a chemise or vest (Hemd, in German; see the two bottom illustrations on this page), next to their skin, day and night, not underpants and other items common today. The rich and upper classes wore fancy versions, the rest simple ones. Only men wore pants as outer clothing, a symbol of their authority (in English we still say "so-and-so wears the pants in the family," as do the Germans in their language) although women would sometimes wear versions of them next to their body when riding or when the weather was cold. Later, with the French Revolution and afterwards, women started to wear long-legged underpants to shield themselves under diaphanous dresses, but it took decades for such pants-like underwear to gain wide acceptance among the upper classes and even longer among the common people. They continued to wear only the chemise under their clothing for most of the 19th century. Women who wore traditional regional costume in Germany (and I bet elsewhere) sometimes wore no underpants until the 1950s. An 18th-century woman (this one is from the upper classes) wore no underpants, just a chemise (long shirt) under her outer clothing (you can see it run horizontally right under her breasts), like the common people, as this engraving shows. She sits on a toilet (Abtritt) while a man peeps at her through the window. 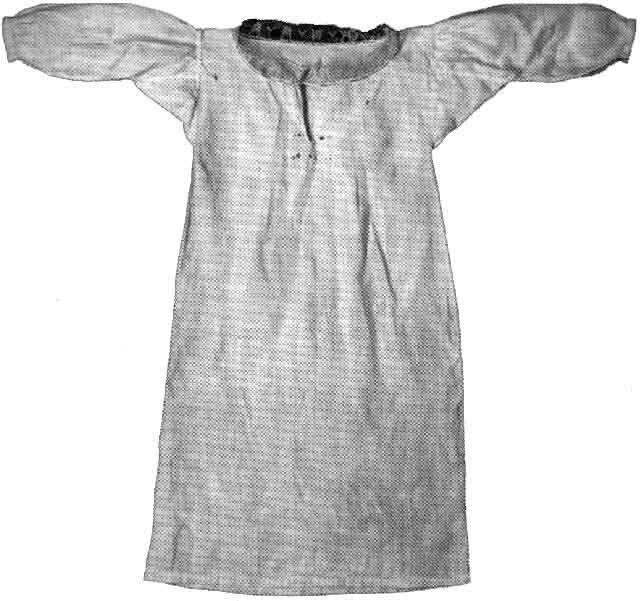 A doll's chemise (Hemd), about 1785, from the underwear exhibit in the Historical Museum of Frankfurt (am Main, Germany), and shown in its catalog "Zur Geschichte der Unterwäsche 1700-1960." Three patterns for women's chemises - A and C "á l'Angoise," B "á la Françoise" - from Françoise-A. de Garsault, L'Art de lingére, Paris, 1771, reproduced in "Zur Geschichte der Unterwäsche 1700-1960." manner or medium without written permission of the author.